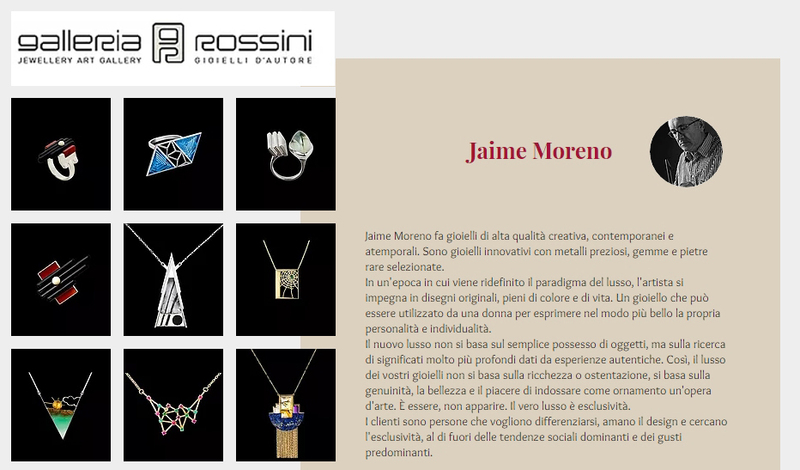 The full collection of Jaime Moreno consists of more than 120 unique and exceptional designs. Not all of them are visible on the website. From time to time we rotate them in our website in order to showcase and highlight all the designs. 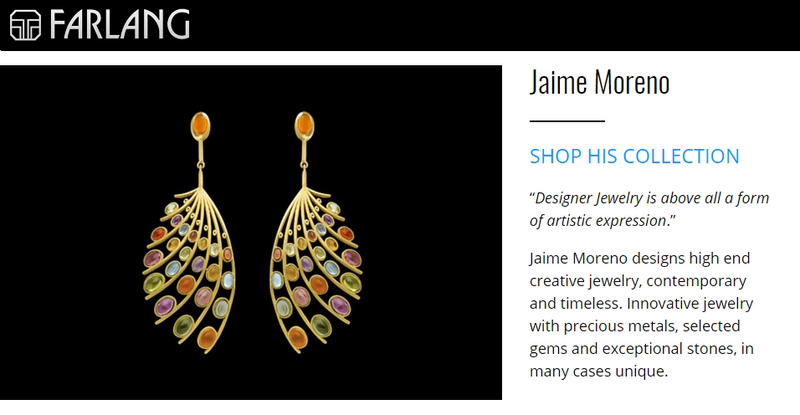 There are three possible ways that you can buy one of Jaime Moreno’s jewels: You can BUY DIRECTLY the jewels that appear in our website, you can BUY ONLINE other pieces that we have on very exclusive and specialized online platforms, or you can BUY BESPOKE jewels either by adjusting an existing jewel to your specifications, or buy asking Jaime Moreno to design a new one from the beginning. If you find one or more designs that you like, press the button “ADD TO ENQUIRY” located at the product page of each and every jewel and we will get back in touch with you to provide you with all the information and tusted advice that you might need. If you don’t find a design that matches your expectations or needs, please do not hesitate to contact us to see if we have the jewel that you need. Jaime Moreno is also present in some of the most prestigious online stores and galleries. If it’s more convenient for you, please find his unique designs by clicking on the images below. Jaime Moreno is a free soul when it comes to designing a new jewel. Away from industry conventions, he finds his inspiration both in Nature as well as in Life. His design and manufacturing process is extremely meticulous putting so much attention to every single detail, not only to enhance the beauty of the jewel and its gems, but to make sure that it enhances the beauty of the beholder. Most probably, you’ve seen a jewel that you like, but you would like it to have different gems or colors, or you want to make specific customizations to it to make it truly a personal experience each time you wear it. Our Bespoke service can adjust your jewel just the way you want it. When it comes to desinging a new jewel from scratch, there will be no designs alike as his creation process is absolutely artisanal and made out from his own inspiration. He has made several commissions for many men and women who have come to him with a personal gem to take the best of it, or with an idea in their minds that he has made an astonishing reality. The commissioning process is very simple, though, the designing and crafting of the piece might vary depending on its complexity from a weeks to several months. Either ways, the journey will be so exciting and the results will be so impressive that the wait will always be worthy. Please get in touch with us and we’ll provide you with all the information you may need to create that unique masterpiece that you’ve always dreamed of.